Topsail Island has much to offer but one of its jems is 26 miles of waterfront properties located on Stump Sound, Topsail Sound or Banks Channel. 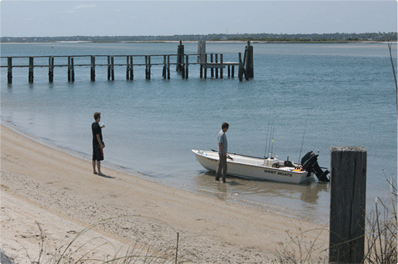 Banks Channel at Topsail Beach offers the prime real estate with deep water homes and lots. It is an everyday occurrence in this area of the island to see 50 to 60 feet yachts docked awaiting the next voyage. Banks Channel is also very close to Topsail Inlet at the south end allowing easy access to the ocean where many enjoy fishing, diving or just plain joy riding. The unique location of this part of the island allows Caribbean like blue water as many have described it! Another prime waterfront location on the island is the canals in Surf City with easy access to the intra coastal waterway. The canals can take many sizes of boats with several very large boats being seen docked in the area. The island also has much shoreline that lies on tidal creeks or marshland canals. These areas are known for the wildlife such as the heron or oyster piper. Usually flat bottom boats are able to access these areas. So no matter your boating style, Topsail Island offers much.